Villa Morena is a small oasis of peace and prosperity, embraced by lush green forest, a few minutes from the breathtaking Akumal beaches. Born as boutique hotel, in an intimate and cozy little place surrounded by nature; trees, flowers, butterflies, birds, crickets, fireflies and stars all around. It’s a project started in 2012, when we left permanently Italy attracted by sunny Mexico, in love with its colors, its vibrant coasts, archaeological and architectural wonders, its smiling people and natural spectacles. A completely ecological project where we put all our heart and so much passion taking care of details. 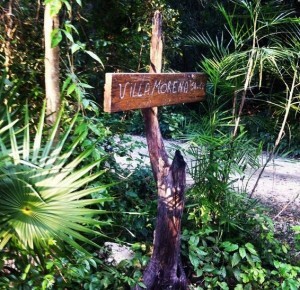 Villa Morena is located not far from the “pueblo” and from the white beaches of Akumal, known for the presence of a large number of turtles and where you have the chance to swim with them a few meters from the shore. Playa del Carmen, famous for its numerous shops and clubs, is only 30 km; as well as Tulum, ideal for a large number of tourists, attracted by the long pristine beach and its hippie vibe. 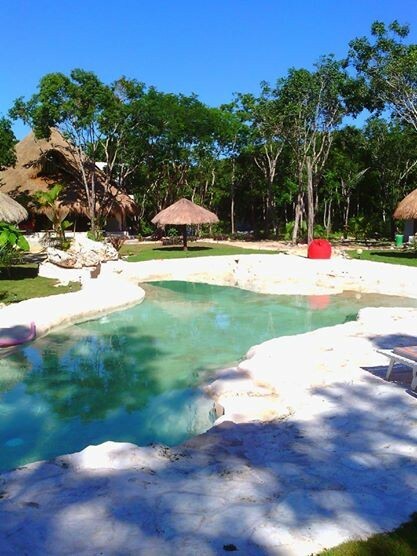 The hotel has just 6 cabañas (bungalows), all with private bathroom, kitchenette and veranda; these are set around a swimming pool carved into the rock and surrounded by a lush tropical garden, perfect to relax and enjoy the surrounding nature. The central building consists in a “big palapa”, a great accommodation and dining site where breakfast is offered to guests and where you can enjoy, on reservation, extraordinary Italian and Mexican dinners, entirely prepared by the expert hands of the owner Morena; here is also located a play corner and a cozy couch on which you may relax and spend time reading a book or listening good music. Also some games are available to children of any age. The electric current is completely produced by the sun through photovoltaic panels, while water is extracted directly from underground canals, numerous in this part of Mexico. Villa Morena has a private p arking for cars but if you are not interested in renting a vehicle is easy to move around freely because we are located not far from the main road that leads from Cancun to Tulum and beyond, thanks to the efficient public transport services that offer frequent passages of bus or minibus with which you may reach any destination. Our guests will experience an extraordinary adventure in a timeless place where we still gets excited in watching a magical sunset with warm colors, lying in a hammock under a thatched roof, lulled by a pleasant breeze and the music of nature. Where we rediscover the pleasure of eating all sitting around a table, to live by the calm rhythms of this land, to meet new friends and feeling at home.